Rudenko in 1982 | Photo © by A. Rasovsky, Planeta publishing. A great surprise for all chess fans happened on the 27th July 2018. Google honored our game with a doodle in the style of 1950s, when the talent of World Women's Champion Lyudmila Vladimirovna Rudenko (1904-1986) was shining at its brightest. Never heard of her name? Let's learn more about it. The future world champion was born on July, 27, 1904 in a small Ukrainian town of Lubny. She was taught to play chess at the age of 10 by her father who was a government official under the tsarist rule, an attorney during the civil war and later became a priest—not the safest career in the Soviet Union. The young woman studied economics in Odessa and played her first chess tournament in 1926. She became soon remarkable for uncompromising improvisational chess, sacrifices and complications. However, the fireworks went awry more often than not. Her friends often asked her to think twice (or even thrice) before sacrificing pieces, but in good shape she was unstoppable. In 1928 she wiped out the strong field at the Moscow championship by winning all 12 games. The ruling Soviet Champion (and the future World Champion) Olga Rubtsova was among her opponents. Soon Rudenko married Lev Goldstein, a prominent scientist in technical cybernetics, and moved to Leningrad (Saint-Petersburg), where ladies' chess was organized on a big scale. About 200 women played in chess clubs, the select women team regularly met men's squads of comparable strength, and women's championships and tournaments were held regularly. Rudenko won the championships of Leningrad in 1932 and 1936, but she was just one among several strong women players in this city, with such competitors as Olga Semenova or Lydia Ageeva. Rudenko also played in some open tournaments. In 1939 she showed good endgame technique to defeat master Nikolay Zubarev, a participant of Moscow 1925 Chess Tournament. Before World War II, there were very few chess professionals in the USSR: the future World Champion Mikhail Botvinnik was a researcher in the Polytechnical Institute, Grigory Levenfish, his main rival in the end of 1930s and two-fold Soviet champion, was a leading engineer of a chemical plant, and Rudenko worked as a planner and economist at various factories. In 1941, after the outbreak of the war, her factory was evacuated from Leningrad to Chernyakhovsk in Bashkortostan. Once at the new site, Rudenko was mandated to return to Leningrad and bring the several dozen children of factory employees who were left in Leningrad in the first wave of evacuation. The Soviet government gave higher priority to the workers and machine-tools to immediately start the production. The front-line approached to former Russian capital. Rudenko managed to gather her flock and to escape the Blockade trap that shut in a few days, soon killing one million civilians by starvation. In the chaos of war, her train covered the distance of 2000 km in 19 days and she had to take immense effort to simply keep everyone fed, not mentioning the shelling and bombardment. To the end of her days, Rudenko remembered this journey and considered the fact that none of the children perished the greatest achievement in her life. The death of Vera Menchik under German bombs in 1944 left the throne of the World Women's Champion vacant and the Soviet Union was in the race. All potential candidates were now trained by the strongest Soviet masters. After the return to Leningrad in 1947 Rudenko was tutored by GMs Alexander Tolush and Grigory Levenfish. She spent much more time on chess than before and greatly improved in her forties, which is a rarity in chess. Still, on the eve of the World Chess Championship, she was considered the weakest among the Soviet ladies (also participating Olga Rubtsova, Elisaveta Bykova and Valentina Belova). Unlike all three of her rivals, she never won the Soviet Women's Championship, and her results were unstable. However, this tournament became a pinnacle of her career. She was in a very good shape, did not miss any opportunity to strike tactically, maneuvered and defended with success and finished at the first place with 11,5/15. On January 19 1950, FIDE vice president Marsel Berman crowned Rudenko with the Champion's laurel garland. In 1952, she won another competition, finally becoming the Soviet champion. A year later, Rudenko lost her World Championship match to Bykova, 10 years younger, but remained very active in Soviet and international competitions for another decade. 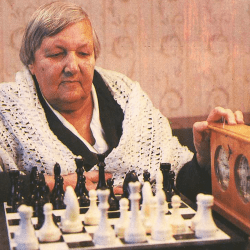 In her last years, Rudenko almost lost her eyesight, but never lost her love to chess.